Dan Yu Kui is one of the few Traditional Grandmasters of Taijiquan and chairman of the Xing Tai Wu Style Taijiquan Federation. Being an exceptional talent and having a wide knowledge and deep understanding of Taijiquan with more than fifty years of continuous daily practice (even during the more difficult times in China), he has achieved an amazing Taiji technique and powerful internal energy. As a young man Grand Master Dan Yu Kui was taught by three different Masters. Through his dedication and hard work he became the best of his generation. In accordance with tradition, a book containing Taiji theory is passed down to the most talented member of each successive generation to study and to record subsequent research into Taiji. Master Dan was chosen to receive the book. 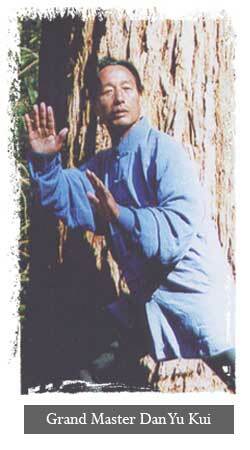 Master Dan is also a lineage master of Yin Style Ba Gua Zhang, Xing Yi Quan and Cha Quan. He is also a Doctor of repute in the field of Wuyi Tui Na Shu. As with other Wu Style Masters preceding him, Master Dan leads a quiet and modest life preferring not to attract attention. Despite this traditional modesty many fortunate students have studied with him, five of these students have been nationally recognised as Master Sportsmen in Chinese Martial Arts and have become lecturers in the subject in China’s universities. Dan Li Jun was born in Xing Tai City, Hebei Province, China. From a very early age, Master Dan followed the family tradition and under his father and grandfather and started learning Wu Style Taijiquan, Ba Gua Zhang, and Cha Quan, studying all his family styles of Chinese Martial Arts as well as Traditional Chinese Medicine. Later, he studied at the Beijing Institute of Physical Education Martial Arts Department for three years, specialising in the research and study of the various styles of Taijiquan, internal arts and Qigong Therapy, etc. During these years, Master Dan had the opportunity to study with many Masters from different styles. He also carries the distinction of Master Sportsman and became a member of China’s National Team. Master Dan also studied TCM at the Hebei Medical Institute and in Beijing and is qualified as a Doctor of Traditional Chinese Medicine PR China.